PowerStar Electrical was designed for use with most electrical engineering design and analysis applications. Use it for commercial building services, industrial plants, distribution systems, power factor correction. PowerSym, a symbol editor tool is supplied free with PowerStar. With this tool, you can edit the standard symbol set file supplied with PowerStar, or create a new file and set PowerStar to point to this file. Designed for use with most electrical engineering design & analysis application. ...... where transformers are involved. * Draw and print single line diagram. * Display complete device information includes node voltages, voltage drops, current, kW, kVA and kVAr flow. * Evaluate the effects of disconnected devices and branches on the rest of the circuit. * Calculate three-phase, line to neutral and line to line load flow. * Click on symbol to display or edit device rating and other properties. * Mouseover any symbol to display electrical data. * Highlight devices with overcurrent, kVA/kW overload, over/undervoltage. * Print or plot to any Windows compatible printer or plotter. * Circuit report format compatible with MS Word, OpenOffice, Mac. 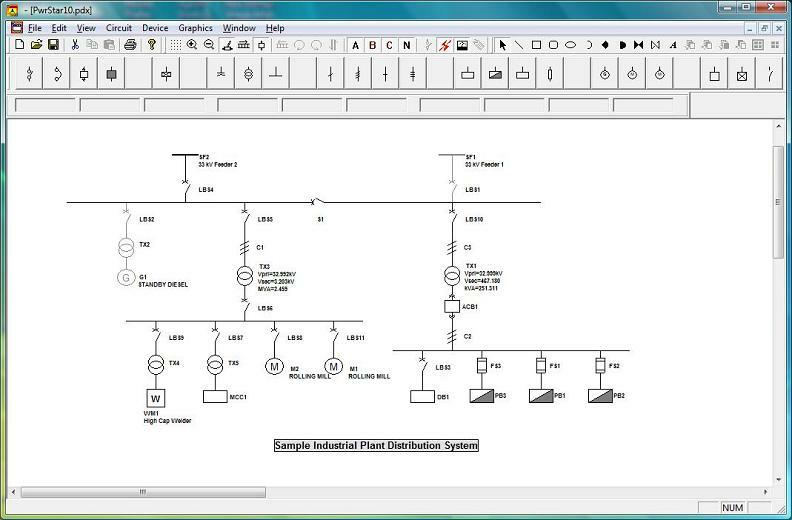 * Use graphics to annotate and add legends, title blocks, logos to the single line diagram. Qweas is providing links to PowerStar Electrical 2.4 as a courtesy, and makes no representations regarding PowerStar Electrical or any other applications or any information related thereto. Any questions, complaints or claims regarding this application PowerStar Electrical 2.4 must be directed to the appropriate software vendor. You may click the publisher link of PowerStar Electrical on the top of this page to get more details about the vendor.